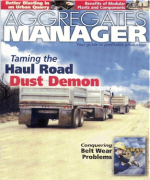 Featured on the cover of Aggregates Manager, HR-TS™, was internationally recognized for its excellent performance in controlling dust pollution on a major haul road in Texas, USA. HR-TS™ is composed of water-based and 100% environmentally friendly polymer compound. Our product HR-TS™ sits on the leading edge of technology for products specifically designed with dust control, fugitive dust, road dust control, soil stabilization, erosion control and soil permeability enhancement as the end objective. With our haul road dust control products program, there is no evaporation or washing out. The initial application and occasional maintenance applications will provide a continuous and permanent accumulation of our dust control product into the soil. Eventually, the dust particles will be overwhelmed by the presence of our haul road dust control products and the frequency between maintenance applications, and the cost of controlling dust pollution will be dramatically reduced. With our Haul Road Dust Control Products, dust pollution is significantly reduced or eliminated with an initial application, and is permanently kept under control with occasional re-applications on an “as-needed” basis. Re-applications of our haul road dust pollution control products will bond with previous ones, thereby cumulatively reducing a need for future treatments. When used properly in sufficient quantities, the results with our Haul Road Dust Control Program are GUARANTEED. Terra Pave International offers three solid programs for controlling your Haul Road Dust. Each program delivers satisfying results for long term haul road dust control. • Permanently eliminate dust pollution. 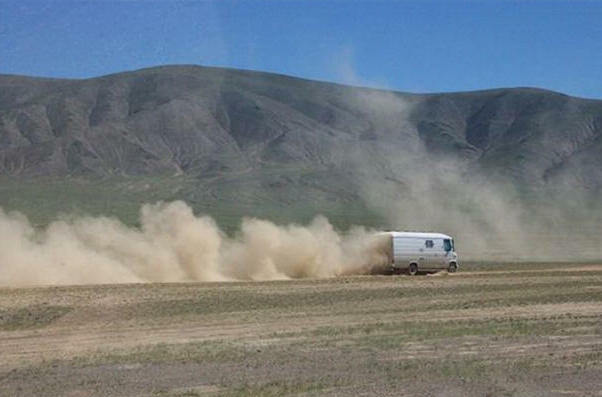 • Reduce dust control expenditures by as much as 50 percent. • Reduce or eliminate continuous daily operations of a water truck. • Eliminate frequent reconstruction of haul roads. Our haul road dust control products are available in 55 gallon drums (208 liters) or in 275 gallon totes (1,040 liters), and can be diluted up to 9 times during an initial application, depending on soil type and desired results. The basic item of equipment that is needed for distribution of our haul road dust control products into the soil is a water truck with an efficient spray bar. Transfer pumps and spray bars are available at a minimum cost, or free when ordering by truck loads or containers. These items will help facilitate a quick and smooth transfer of the product from a water truck into the soil. If general reconstruction and permanent reshaping of a haul road is desired, then other types of equipment, such as a motor grader and a compactor are highly recommended. Information on specific application procedures for our haul road dust pollution control product can be obtained directly from our company. Although there are many variables to consider in a haul road program, the cost of the first year of a haul road dust control program with our haulage road dust pollution control product will generally not exceed the actual or estimated cost of daily watering operations. After the first year, the cost of continuing maintenance under our Haul Road Program is Guaranteed to be significantly lower than daily watering operations, and over a period of several years, the savings can accumulate to as much as 75 percent. With an initial application of our haulage road dust pollution control product, dust pollution is immediately eliminated, and with occasional maintenance applications, it is permanently brought under control. We recommend that haul road managers undertake their dust control programs with our haul road dust pollution control product in segments of approximately one mile at a time. (Segments of less than one mile tend to become more easily reoccupied by contamination that has been blown in or imported by traffic from non-controlled areas.) With availability of sufficient equipment and personnel, a mile of a typical haulage road of approximately 20 yards width can be treated and finished in a single day. The savings that are derived from using our haul road dust pollution control product in the early stages of a dust pollution control program can then be redirected into future segments, thereby taking advantage of programming the product to pay for itself. There are two phases in the haul road dust pollution control program. The first is the initial application, and the second is the maintenance program. An initial application of our haulage road dust pollution control product will produce immediate results and a continuing maintenance program will insure permanent success. A substantial amount of product is used during the first phase in order to cover and control the majority of the dust. In the second phase of the program, the product is much more diluted, and therefore, significantly less expensive per square yard. The higher dilutions during the maintenance phase allows the product to penetrate more effectively into the previously hardened road base as it tackles newly worn areas or areas with new contamination blown in by the wind or carried in by haul trucks. The first phase of the Haul Road dust pollution control program will consist of an intensive initial application that will be followed by a series of higher diluted maintenance applications occurring on an as-needed basis. In a typical haulage road environment, the cost of controlling dust with our haul road dust pollution control product during the first year is expected to be less than the alternative cost of daily watering operations. Maintenance applications will continue throughout the second and subsequent years on a gradually less frequent basis. There will be a continuing buildup of our haul road dust pollution control product in the soil as the dust becomes heavier and much less likely to become airborne. This trend will continue into the future and will eventually reach a point in which the budget for controlling dust pollution will only be a fraction of what it was for daily water truck operations. Free on-site technical assistance will be available for new customers following in our Haulage Road dust pollution control program. Hot-line assistance and continuous monitoring of dust pollution levels are available from Terra Pave International’s main office at all times. Reports will be provided as needed. Let Terra Pave International help you with your Haul Road Dust Control Projects.